From its beginning, Paso Robles ("PASS-oh" to the residents) and its oak-tree-studded hill country have been destinations for visitors. In the early days, they came to dip in the area's natural hot springs--and they still do--but come to sip in Paso's winery tasting rooms. These visitors find a charming, lively downtown surrounded by a wine region that sports a growing cadre of wineries. Using the resources below, plan a fun, relaxing getaway to Paso Robles in just a few minutes. Paso Robles is popular with wine lovers seeking a more laid-back experience than that of busy Napa. It's a great place for couples and food-lovers, but, if you're looking for a family getaway in the region, you might be better off in nearby Pismo Beach. The most popular time to visit is early or late summer, when the weather is best, and during the fall grape harvest. Paso gets busy, and hotels fill up during the wine festivals, but you can have fun there almost any time of year. Another good reason to go in summer is the chance to catch a concert Vina Robles Amphitheatre, one of the most intimate venues in the state. 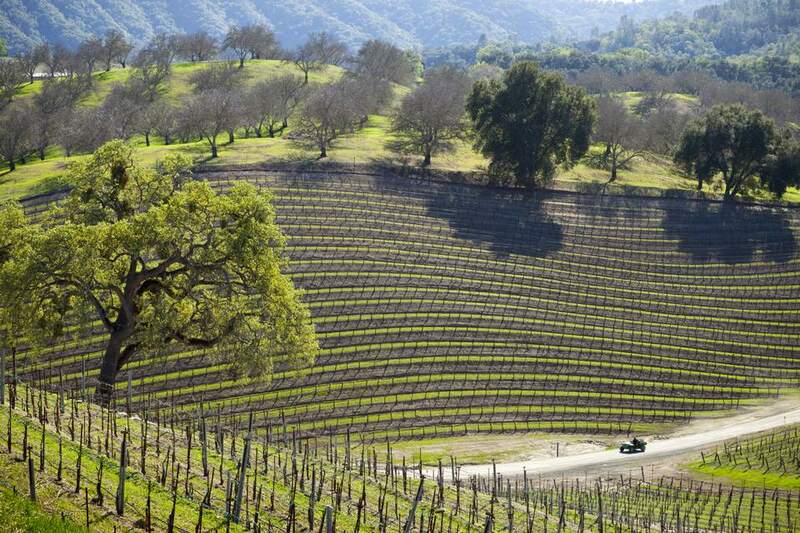 Paso Robles up-and-coming wine country is changing at a head-spinning rate. Just a few years ago, the best you could expect was a standard, stand-up tasting of a few wines, but new players are raising the bar and creating the region's own particular style of wine culture. Cabernet Sauvignon and Merlot dominate Paso Robles wine production, but you can find almost anything at the hundreds of area wineries, including some varietals little known elsewhere in California. Many tasting rooms are simple, basic places that are fun if you go wine-tasting primarily to find new bottles for your cellar. Tasting is free at many places, with others charging a small fee. Vina Robles: Vina Robles never fails to impress. It stands out with top-notch wines using lesser-known varietals, a nice gift shop, and a tasting room filled with innovative artwork. It hosts periodic, lively wine dinners and is also the home of the beautiful Vina Robles Amphitheatre. Vina Robles has some well-priced, high-quality wines, too. JUSTIN Vineyards and Winery: One of Paso's oldest and most respected wineries, JUSTIN produces mostly Cabernet Sauvignon and red wine blends along with a few whites and a very nice, dry rosé. The tasting room looks out over the vineyards, and, on a pretty day, you can sit on the outdoor patio. It's all so pleasant you may end up lingering longer than you planned. In fact, it's a good idea to plan a longer stay, making reservations for a meal in JUSTIN's top-notch restaurant. To get a full immersion in all things JUSTIN, go for the full "Justin experience": wine tasting, dinner, and an overnight stay at JUST Inn, the on-site lodging. Daou Vineyards: Daou's hilltop location gives you expansive views and a very pretty facility from which it offers wine-and-food pairing options. It can be overly busy at times, making it difficult to enjoy the view; however, if you can snag a nice place to sit outside, you won't regret the time you spend enjoying Daou's offerings. You can also go wine-tasting on foot in downtown Paso. Many wineries have tasting rooms on the streets surrounding the park, and you could easily make an afternoon of visiting them with no worries about driving. If you'd like some transportation for your wine-tasting adventure, try The Wine Line or Grapeline Wine Tours. Visit Mr. Hearst's Castle: Five miles inland on CA Hwy 46 and Hwy 1, through the Templeton Gap and north along the coast, is the Mediterranean Revival mansion built by media mogul William Randolph Hearst. Designed by architect Julia Morgan, the oversized main house and guest cottages, larger than many people's main residences, give a rare peek into the lifestyle of the rich and famous in the early twentieth century. Taste Olive Oil: Paso Robles is also quickly becoming a center for olive oil production. A favorite stop for olive oil tasting is Kiler Ridge, a young producer with a lovely tasting room and beautiful views. You can also try local olive oils at We Olive downtown and on weekends at Alta Cresta Olive Orchard and Pasolivo. Soak up Some History: Venture just a few miles north of town off US 101, and you'll find Mission San Miguel Arcangel, California's 16th Spanish mission. Nearby is Rios-Caledonia Adobe, a 19th-century inn and stage stop. Tour a Brewery: If you've had enough of wine tasting and want to learn about how beer is made, the award-winning Firestone Walker Brewing Company offers tours of their facility (and beer tasting) at 1400 Ramada Drive. Tour the San Luis Lighthouse: This lovely lighthouse is open by reservation only, and they offer a shuttle bus to get you there. Or add some exercise to your day by taking their guided hike instead. Details are in the San Luis Lighthouse Guide. Relax: River Oaks Hot Springs and Spa offers massages and outdoor hot tubs overlooking the hills. Some of the local hotels, including Hotel Cheval and Villa Toscana, also offer in-room spa treatments (book ahead). Shop: Besides the tasting rooms and restaurants downtown, you'll find some interesting local shops. Studios on the Park is worth a stop to see the works of local artists. The California Mid-State Fair runs from late July through early August, with performers such as Aerosmith and Leann Rimes, livestock competitions, and a variety of entertainment. The rest of the year, the Paso Robles Event Center sees a steady stream of activities. As you might expect, wine dominates the festivals, with a Zinfandel Festival in March and the Wine Festival in May. Individual wineries also host some fun and exciting events, so you'll want to see what's happening while you're there. The difference between day and night temperatures in Paso Robles is greater than in a lot of other places. Even a hot day can develop into a cool evening, with as much as 40°F difference between the day's high and low. You can pick up a map of the local wineries at most local hotels or winery tasting rooms, or just drive east or west along CA Hwy 46, where you'll find plenty of them. Our simple rule for casual wine tasting is never more than three wineries in a day. Stop at more, and not only are you likely to get a little tipsy (dangerous for driving) but also all the wines start to taste alike. As a result, you may buy something you'll later regret. Paso Robles gets very busy during the wine harvest in October, during local festivals, and on holiday weekends. Demand outstrips supply for Paso hotel rooms at these times. Reserve as far ahead as you can for more options. The Restaurant at JUSTIN is a winner if you like a fine meal served at a leisurely pace. Paso Robles weekend lunches can be had at Cello restaurant at Allegretto Resort or with wine on the patio at the Restaurant at JUSTIN. Residents say the Templeton Saturday farmers' market is the area's best. To get there, exit US Hwy 101 south of Paso at Las Tablas, go west to Old County Road, and turn right to the park at 6th Street. If you stay downtown, it's an easy walk to restaurants and the local cinema. The Paso Robles Inn is one of the town's oldest lodgings, but it gets somewhat mixed reviews. Hotel Cheval (also downtown) is a nice choice among Paso's high-end lodgings. Allegretto Vineyard Resort opened in late 2015 as an excellent addition to the options in Paso. It's a larger property, with a pool, a spa, and an on-site restaurant named Cello. The staff is super-friendly, and the layout seems to provoke play and relaxation. The restaurant caters to vegetarians and vegans as well as omnivores. Its chef does his best work when he's being innovative. The Summerwood Winery Inn is a delight anytime. It's beautiful, well situated, clean, and the staff is superb. But wait! You're also guaranteed to enjoy JUST Inn. Quite a few of the local bed and breakfast inns are located at wineries, making for a doubly fun experience. For other ideas, try TripAdvisor, where you can read reviews and get rate comparisons all in one place. Paso Robles's tourism industry is growing so fast it's sometimes hard to find a place to stay during busy times, but we have a couple of secrets to help. About 5 miles north of Paso Robles, the Vines RV Resort has cottages for rent at rates comparable to hotels in Paso Robles. With room for 6 and a full kitchen, they’re ideal for family stays. They require a 2-night minimum stay Sunday through Thursday and 3 nights minimum on weekends, over holidays, and during special events. That sounds like a good idea if you own an RV, but what if you don’t? The answer is easier than you think. Luv 2 Camp will rent you an RV, deliver it, and set it up at any one of quite a few area campgrounds and RV parks. Paso Robles is located just off US Hwy 101, 158 miles south of San Jose, 204 miles from San Francisco, 207 miles north of Los Angeles, and 110 miles from Bakersfield.